So this past December, I decided my life needed an overhaul. I have always been riddiculously unorganized. Being a mom for over 5 years at this point, you would think I would've gotten my crap together sooner, but I digress.. Step 2 was buying cute stuff for the planner. There are so many different useful items to choose from. I decided to buy little folders that stay inside the planner to help organize the mounds of stuff I would inevitably purchase. Now if you're anything like me, stickers are pretty much priority #1. I found SO MANY adorable and affordable stickers on amazon.com. 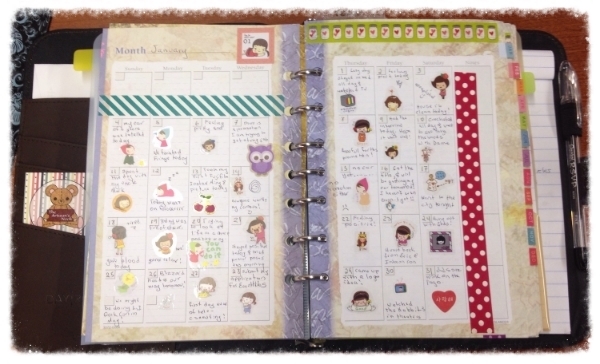 Depending on how obsessive you are, you might realize all of the stickers you bought won't actually fit in the planner at one time (a friend told me of her struggles with this, not me..) That just means a little prioritization is in order, and perhaps a rotation schedule. Don't forget to make room for different colored pens, highlighters, post-it notes, post-it flags, washi tape, Mark-it dots, etc, all to help you organize your life. Don't be afraid to put time into yourself, for yourself. Future you, will be grateful. Thanks for reading, and stay tuned for more ^_^.